This webinar highlights the journey to become Data Driven Facilities as experienced by two healthcare organizations; The Fred Hutchinson Cancer Research Center (Fred Hutch) and Grays Harbor Community Hospital. The Affordable Care Act promises to increase health insurance coverage for millions of Americans and at the same time, bring down health system costs, as more healthy individuals would be paying into the system. The long-term success of the ACA remains to be seen, but there are current - and very real - consequences for healthcare facilities and the teams that manage them. 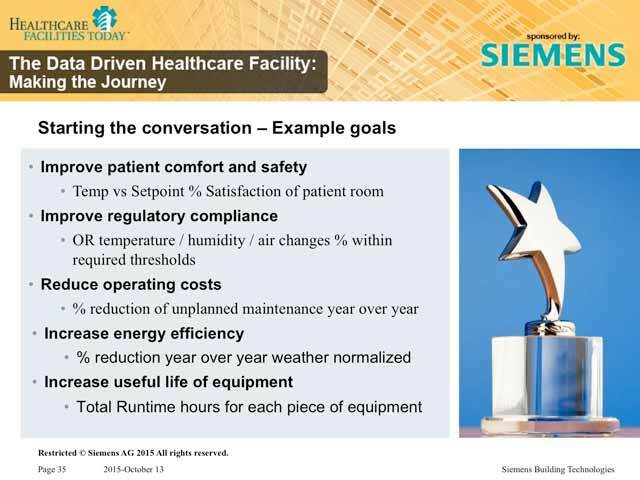 This webcast, presented by David Stepelevich of Healthcare Building Solutions, Inc., highlights the key elements of compliance and will help you ace your healthcare facility inspection, even when you're not planning on one. You'll learn what to do, and what NOT to do, before the survey team knocks on your door.